Who decides what country you are in? Eternal Remont has pointed here to the problem of Abkhazia on Facebook. It seems Facebook recognises states not nations. So groups are now developing for Abkhazians who consider they are not in Georgia. It's also a big problem for Kosovo. If you find yourself in Pristina, on Googlemaps somehow you passed the Kosovo border and ended up in Serbia, which is illegal in the real world. I tried to put my favourite bookshop (which is in Pristina) on LibraryThing, but it wouldn't let me put Pristina in Kosovo, so I had to leave the state blank. 1. Priština, Serbia (also known as 'Pristina') Near Kosovo, Lipkovo, Novi Pazar Verify on a map. and if you do verify on a map, it's not clear whether Pristina is in Kosovo either. Very confusing. It seems that some time ago, Podgorica moved from Serbia and Montenegro (as my old Outlook version insisted) and is now in just Montenegro, according to most software I use. My iPod Touch thinks I am in Kiev. It doesn't allow me to be in Tbilisi, but I can be in Yerevan. Just out of interest, who is it who decides which countries go in those drop down boxes. I assume most people use boxes from a standard programme library. But who decides when it is time to change the countries? I wonder how long it takes to get new countries into the dropdown box for countries on websites. Librarything has this new feature Librarything Local where you can put your favourite bookshop, and local book events. I was trying to add the Dukagjini bookshop in Pristina as one of my favourites, (review here) and so of course I wanted to add the country Kosova. In some boxes, like those in Outlook, you can just write in, in the field, so it was never a problem for addresses when I was working there, or for Montenegro, come to think of it. But in Librarything, there is no way to enter the country Kosova. So apologies to Kosova and Dukgjini Bookshop. This Turkish verb tense allows the speaker to distance herself from what she is saying and to avoid taking responsibility for her words. It's also known as the gossip tense. In a moment of enthusiasm I bought a book on the Albanian language, hoping to use it in Kosovo. In fact I managed quite easily with English and German. In fact my German improved talking to German speaking taxi-drivers though most would rush you with "sprechen Sie deutsch" and then give up, after the "wenig" you admitted was more than theirs. "the verb in Albanian has nine moods: indicative, subjunctive, conditional, imperative, infinitive, participle, gerund, admirative and optative. The indicative has no less than eight tenses"
Just for fun (sic), have a look at the admirative and optative moods, which do not exist in English. Both of them have two tenses. Somehow that makes me think that a country which actually regularly need those sort of expressions must spend a lot of time dreaming or writing poetry. More recently I have been brushing up my French grammar (in a good cause, I hope). I asked Bee (recently having taken GCSE French and considers herself rather good) about the past historic. She said that to do GSCE French these days there was no need to learn any tenses apart from the present. I stopped French after 4 years, as I preferred German and Latin, so I never discovered what they learnt in the 5 year for the exam, but even then I had a full knowledge of past, present, future and all the perfects, infinitive, imperatives etc. I defy anyone to say that French GCSE has not got easier. I suppose I always felt that to be able to write in the past historic would be the culmination of my French education, since that was what I understood famous writers used. (Perhaps another reason I never read them, being put off by the need to learn the new forms). When Sloph started French school (we lived there for 4 months in the early 90s) we were impressed that schoolkids were already familiar with something we were not. She was not, because she had a rude awakening that other languages had grammar, which had to be learnt. So there I was, ready to brush up my past historic, when I realised that I had read the French translations I was given without any problem. On inspection I found it was all "a souligne", "a pris note, a recommande". OK not very literary stuff, and easy to guess if you know the context. But it was "official French" a Traduction de Courtoisie. If the aim of this is to keep the use of French alive in the Maghreb and the Mashreq, then there would be hardly any point in doing a translation badly. So my question is: what has happened to the French past historic and does anyone use it any more? The Students Independent Association of the Judicial Faculty of Belgrade has begun an initiative for Serbia to give Kosovo to Russia for the price of one Euro for 99 years. As compensation, Russia is obliged to assure peace and stability in Kosovo, security for the remaining Serbs and the safe return of all Serbs and non-Albanians to Kosovo. “Naturally, this would ensure the reconstruction of churches and orthodox monasteries, which have been destroyed during the last seven years,” reads a press release issued by the Students Association. The students are convinced that the international administration in Kosovo, consisting of the representatives of dozens of states, for seven years now have not been capable of creating peace and security for the Serbs. According to them, the very powerful state of Russia, which is considered to be a world power and a friend of Serbia is very well capable of doing so, so FoNet, reports Koha Ditore. This proposal was sent to the Assembly of Serbia, the Government, the Presidential Cabinet, and the Russian Embassy and is expected to be sent to the so-called Coordination Center and to the Contact Group as well, reports Koha Ditore. Students will be students, but clearly what they are learning in the law faculty is pretty much Putin's view of the rule of law, also commented here by the Jamestown Foundation under the heading "Putin upholds non-existent rule of law in Russia". This is the most detailed and authoritative prediction of what Martti Ahtisaari is going to say about Kosovo's status that I have seen. It's by Tim Judah and has lots of detail about the UN procedures involved in changing Kosovo's status, but also lots about the uncertainty about what is actually going to happen. And that's without factoring in what might happen in Serbia after the election. The source is Balkan Insight, (BIRN, Balkan Investigative Reporting Network) a website dedicated to "reporting the Balkans on its path to Europe", which I haven't seen before. Looks a well presented website with email newsletter subscriptions and RSS. They are also offering a documentary film on Kosovo's final status, called "Does anyone have a plan?" Seems a pretty apt title. Several people have voiced their fears to me in the last few days that the international community is not going to provide a clear cut decision on status but is going to offer some sort of conditional status that leaves Kosovo in limbo for another few years. So many economic issues cannot be solved until it is decided whether Kosovo is a country (and could give sovereign guarantees for loans), assets can be handed over to the government which can then decide to privatise them or not. Investors need to know with whom they are dealing in the longer term and that there will be stability. Some sort of a fudge will be a disaster. I suppose the Contact Group is trying to prevent Kosovo being used as a precedent in South Ossetia etc, but Russia will choose to interpret any solution in its favour whether it is justified in international law or not. In the meantime, the EU is setting up the organisation which will take over from UNMIK in Pristina. I am feeling like an employment agency as I pass out information to people who want to apply for the local jobs and I decide who I can reasonably write references for. There is general cynicism that posts will go to those with connections, despite the apparent EU recruitment procedures. People haven't much idea of what the jobs mean (eg Communications Officer, when their experience is mainly no internal communication at all) and all the over-20s have had their education and job experience interrupted. Only people who have worked abroad have much experience of a normal working environment. It's hard to advise people what they might do when too many people are chasing too many jobs. In the ministry they earn 200 Euros a month, which is considered a pittance for serious work. One woman pays 100 Euros for her childminder and so is practically working for nothing. Another 5 years of conditional independence will remove any hope of change and could prove explosive. KEK is Kosovo's power company. Since the war it has been in deep financial trouble as people have not paid their bills and illegal connections mean that people are stealing electricity. This situation has been condoned by the international community in the first few years and now it is hard to rectify, given the corruption that has developed in KEK. The result is rolling power cuts, frequent breakdowns of plant and expensive imports. Recently KEK trade unions scored an own goal by complaining that international KEK managers were vastly overpaid. As a result, even more people refused to pay their electricity bills with a drop of 2mill Euros in collections in September. However KEK is now getting tougher, and collections have improved again in November. It seems that even the Kosovo Trust Agency has not paid bills due from privatised SOEs. If the internationals don't pay bills, what hope is there? KTA is the nominal owner of the assets of KEK and responsible for its management. What is going on here? Now the Minister of Energy and Mining is claiming that civil servants will not get paid if they can't show they have paid their electricity bills. Municipalities have been told that unless they have paid their electricity bills, their accounts will be blocked (by the Ministry of Finance?). Since the summer, KEK has had a new female Managing Director, and of the four division heads, two are women. Does this mean that a new regime has taken over, which is forcing UNMIK and the government to work on the problem? Or has the Kosovo government finally realised that without electricity, the country will never have economic growth, people will stay poor and both main parties will have no one to blame after status is settled in a few months (or even weeks)? Hmmm. We shall see. But at least the talking is getting tougher. 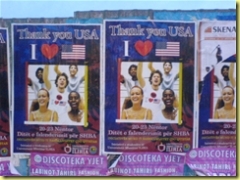 On the day that Bush was routed in the mid-term elections, it was strange to see these posters even though Kosovars have lots to thank NATO for. Sorry for the quality of the photos taken by mobile phone rather quickly. 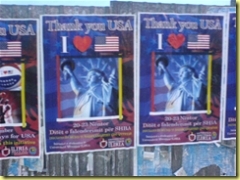 The posters are mounted on a fence of corrugated iron pm what becomes Bill Clinton Avenue. Underneath the picture it announces "Days of thanksgiving" for 23-24 November, on the initiative of the Illyrian Royal (sic) University". Shame I shan't be there to find out what happens on the day. Next day most of the posters had been damaged. There's a lot on at the moment, with the Pristina Jazz Festival last week and the International Film and Theatre Festival this week (www.skenaup.com). So Serbia won its referendum on the constitution, proving exactly what? The constitution was not drafted by any elected body or much discussed. Despite the constitution stating Kosovo is part of Serbia, Kosovars were not invited to vote unless they were Serbs, who were given strong directions from Belgrade on which way to vote. I hope the EU takes note of these democratic procedures. Now Serbia is trying to delay the announcement of the status of Kosovo until after its elections. This is seen by all the international community as merely a delaying tactic. The elections are called mainly to disconnect the government currently negotiating with the UN over Kosovo from the new government which will be in power when the result is announced, so it can avoid blame for "losing" Kosovo. In fact, most realistic Serbs understand that Kosovo was lost long ago. Of course, the date for the elections is now part of the delaying game. But it seems the Contact Group may call Serbia's bluff unless the election date is announced this week, and they will make the announcement by the end of the year, as originally intended. Belgrade is also instructing Serbs not to cooperate with the long overdue census in Kosovo. Is this to further distort the statistics to show that Serbs are being forced to leave? Or is it an own goal in the statistics that Serbs have always lived in Kosovo and will continue there?